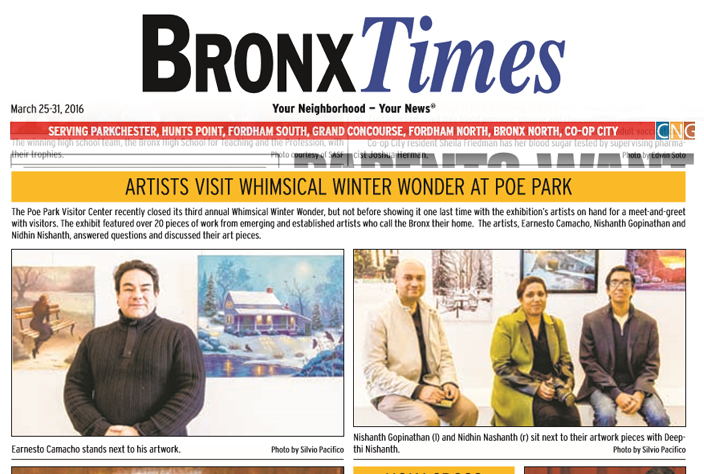 The Poe Park Visitor Center recently closed its third annual Whimsical Winter Wonder, but not before showing it one last time with the exhibition’s artists on hand for a meet-and-greet with visitors. The exhibit featured over 20 pieces of work from emerging and established artists who call the Bronx their home. The artists, Earnesto Camacho, Nishanth Gopinathan and Nidhin Nishanth, answered questions and discussed their art pieces. Nishanth Gopinathan (l) and Nidhin Nishanth (r) sit next to their artwork pieces with Deepthi Nishanth.